To start with an aside, I love that the drive-thru guy at Dunkin Donuts always comments on my hats. He loves my purple beret and always complements me on how good I look in it. Today I wore the black bowler, as it happened to be handy in the living room when we ran out the door because I forgot that I needed the car today. It’s been kind of a messy morning. Anyway, drive-thru guy commented on the different hat and told me he liked the purple one better, though this one matched my coat as well. He’s a lovely human and I’m glad he works the mornings when I get coffee. Random story aside, the moral of this post will be: moms are great people. If you don’t feel like reading the whole thing, there it is. I’m sitting here writing to you, a little late due to the messy morning, but sitting at home, nonetheless, because my wonderful mom-in-law volunteered to drop off our cats at the vet for their surgery so we didn’t have to drive out ridiculously early and then drive back so Logan could get to work. Again, moms are great people. 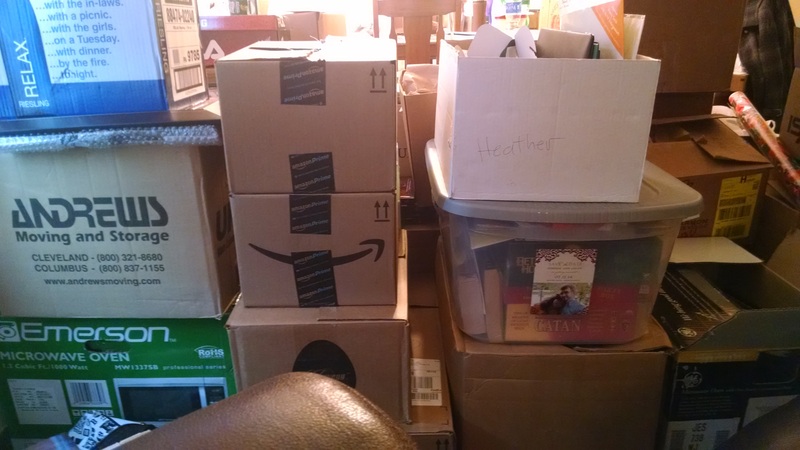 The pile of boxes beside my chair is ever growing. Yesterday my mom and mom-in-law came over to help me pack up the kitchen. It was quite lovely, actually and they were so helpful. We got most of the dishes packed up with some left out for us to use until Friday and the silverware in need of a box. The silverware kind of scares me, but you know, we’ll figure that out. We spent all afternoon wrapping things in newspaper, brought by my mom-in-law, and emptying my cupboards and draws. The pile of stuff has pretty much more than doubled. We also managed to clean out under the sink in the bathroom, which was a little scary in itself. The bathroom has been pretty easy, though. The only complications I can think of will be taking down the curtain and packing up the shower stuff Saturday morning. Logan will want to shower that morning, I think I’ll wait for the new shower after all the work is done. So I guess I could pack up my shower stuff Friday after it’s had all day to dry out. We’ll see. It’ll be an adventure. With the kitchen and bathroom finished, we have two rooms to go: the scary rooms. The bedroom and the back room. Both places of general disorder where we tend to toss things that don’t actually have a proper place to go. My husband is afraid of these rooms, but I’m thinking they won’t be as bad as they appear. Well, maybe the back room, at least. A lot of it is already packed anyway, the whole closet is basically just college stuff I never unpacked to begin with. And some of those boxes in there can be packed with more stuff, thus helping the whole box situation. I apparently greatly underestimated the amount of boxes we would need. Or, rather, the size of boxes that we have. We still have a bunch of boxes, but they are little boxes, with two big boxes left and then one full of packing material. We should probably stop by the Fine Wines and Good Spirits near by and ask if we can have some of their boxes. They’re all sectioned off so they’d be great for packing the beer glasses and things Logan has that I’m now terrified of breaking. I accidentally smashed the tall one on the crock pot the other day while trying to put it in the drying wrack. I’m terrified that I’ll somehow break more while trying to pack them, or perhaps, not pack them well enough and they’ll all be shattered by the time we get there. They are the last things left in our cupboards, along with the scary wine glasses, which are in a similar place in my mind. Tiny stems are frightening. So, yeah, the packing continues in the Scavo apartment. It’s funny, the things you find while digging through closets and shelves you haven’t looked at in a year. I found two gift cards and a memory box from college I totally forgot about. We’re apparently really bad with the gift cards. I’ll have to try and keep track of those. We’ll see how that goes. I kind of want to look in the memory box. I resisted that urge when I found it because I wanted to be productive, but it’s in an open box next to me now and I kind of want to peek. Also wedding pictures, those are in there too. Anyway, today I’m thinking of tackling the bedroom. I feel like it mostly looks bad, but in reality isn’t all that much stuff. I’ll pull out some of the boxes from in the closet and sort and fold and pack and it’ll be fine and maybe Logan will feel better about it once all my stuff is off the floor. Here’s hoping. And I hope you all have a lovely day, my friends.